Crab | Morning Coffee . . . This recipe is from Rachel Ray’s new Cooking Show entitled “Week in a Day”. I really didn’t plan to share it, so I didn’t take pictures of the process of cooking, just of the end result….but the directions aren’t hard and it will be well worth your time :). I made just a few adjustments, simply because I couldn’t find a couple of ingredients that Rachel listed, but the changes were still wonderful :). Bring a large pot of water to a boil over medium heat, then salt the water. Add the pasta and cook for 3 to 4 minutes (it will be undercooked). Cool, drain well and add to a large bowl. Meanwhile, in a medium saucepan, heat 2 TBLS. extra virgin olive oil, and 2 TBLS of the butter over medium to medium-high heat. Add the celery, onion, red bell pepper, garlic, bay leaf, thyme, lemon zest, salt and pepper, to taste. Cook to tender, 6 – 8 minutes. Add the crabmeat to the vegetables (flaking it as you add it) and sprinkle liberally with seafood seasoning. Stir to combine, then remove from heat. In a medium sauce pan, over low heat, melt 3 TBLS butter and whisk in the flour. Cook for 1 minute, then whisk in the milk and bring to a bubble. Season the sauce with salt, pepper and nutmeg, to taste, and cook for a few minutes, until the mixture coats the back of a spoon. Add the mustard and the cheeses and stir. Add the vegetables/crab mixture and the sauce to the bowl with the pasta. Stir all ingredients and transfer to a casserole dish (9×13). Melt a 2 – 3 TBLS butter in a small skillet, over low heat and add 3 TBLS (or adjusted to your taste) hot sauce. Warm through, then add the panko crumbs and toss to evenly coat the crumbs in sauce mixture. 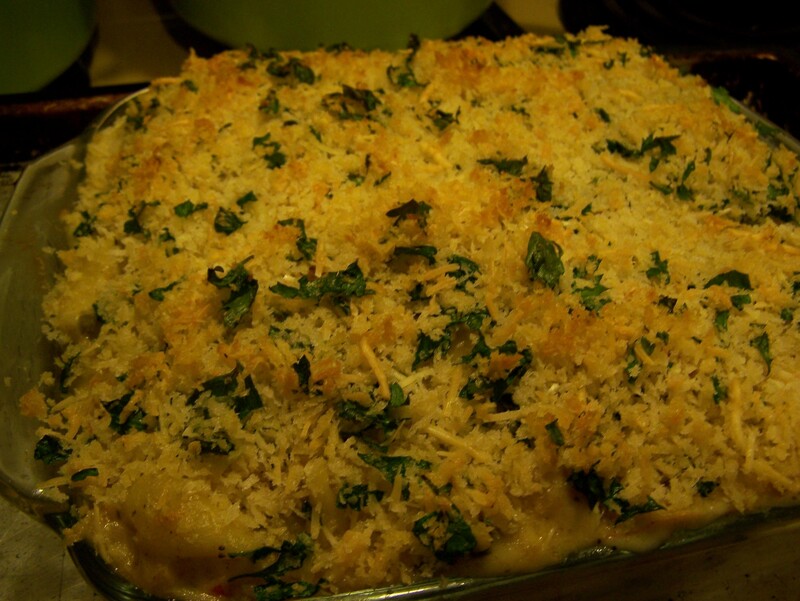 Cool the crumbs, then toss in the parsley and 1/2 cup grated Parmigiano-Reggiano cheese. Top the mac n cheese with the spicy crumb mixture. Put the casserole on a baking sheet to catch any drips. Bake until brown and heated through, about 10 minutes. 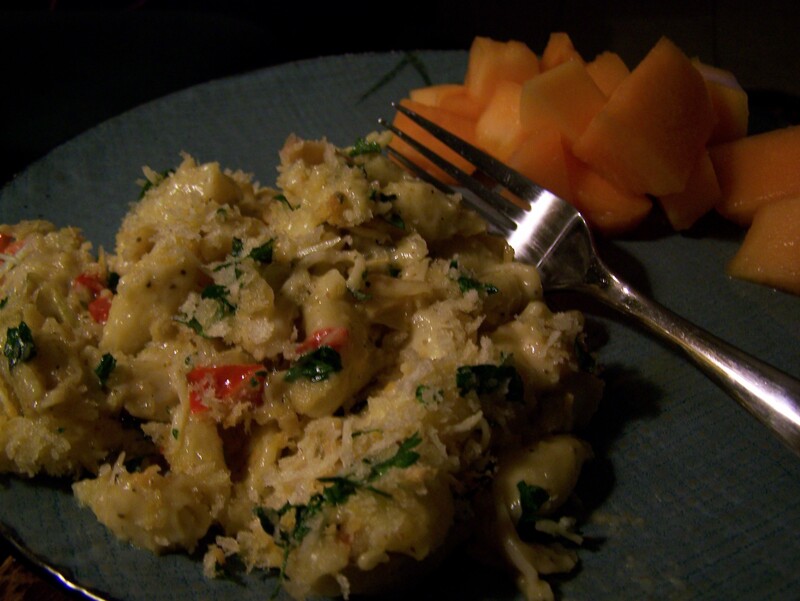 Yum….complement with a salad or some fruit and Enjoy! This Dish is seriously yummy … ya gotta try it! What a flavor combination … Lecker! !